Depending on their experience of motor racing, the term ‘Full Contact Racing’ can muster up a couple images in peoples minds. For some people it will be a return to that wrong image of ‘Stockcars’, of drivers in old scrapped cars smashing seven bells out of each other in an attempt to wreck their opponents vehicles and disable them from the race. For other people it will be an image seen regularly in British Touring Car racing, or that of NASCAR, epitomized in the classic 80’s movie ‘Days of Thunder’ with the line “Rubbing is racin’ son”, where gently touching the car in front in an attempt to pressure the driver into making a mistake, is deemed within the rules. ‘Full Contact Racing’ as experienced in BriSCA F1 Stockcars is neither of those. It is a very skilled form of racecraft that can take many years for a driver to hone his skills in. It’s true to say that over 50 years ago, when BriSCA F1 was in it’s infancy, the contact side of the sport was very crude, an almost “whack ’em, and see” attitude of just trying anything to move the guy in front out of the way. However, as with all aspects of the sport it has evolved over time and can easily be seen, like the car design, as an art form to itself. In fact the evolution of the ‘Art of Contact’ has had a direct affect on the car design. It is very wrong to assume the only form of contact is to just smack the guy in front as hard as you can. There are many forms of contact, all with unique advantages and disadvantages, and all of them have specific uses for particular moments on the track. The Basic Shove – The most basic form of contact is of course the basic shove. Used when entering into the start of a turn, the attacking driver when in a position to do so, will leave his braking a touch later and use an opponents car in front to help reduce his speed. In doing so the momentum is passed into his opponent who is forced to go wide into the turn, allowing room for the attacker to now take the inside line. One of the disadvantages to this method is that the attacked car now has the wider line around the turn, allowing him to get on his accelerator sooner, allowing him to be carrying more speed at the end of the next straight. This of course gives the opponent the opportunity to repay the complement into the next turn. The Ghost Push – This is a more advanced form of the Basic Shove that requires far more skill. As an attacker chases his opponent down the straight, he will gently ‘press’ on to their rear bumper, keeping the contact force down to minimum and maintaining the element of surprise. As the two adjoined cars approach the braking area for the turn, the attacking car uses their momentum to push the opponents car past their optimal braking point and thus sending them out wide into the turn, and giving the attacker the inside line. The Pool Trick – This maneuver is used to when an attacker is faced with two opponents in front. As they approach the braking area of a turn, the attacker uses his car very similar to a cue in pool or snooker. He attacks the car immediately in front with enough force that the momentum carries the attacked opponent forward into the second car in front, sending both cars wide, and allowing the attacker to take the inside line past both of the opponents. Parking – As an attacking car chases down an opponent in front, he may spot a third car (or a small pack of cars) stranded in the middle of the approaching turn, who have had their own incident and may be trying to get themselves back into the race. The attacker may use this track blockage to their advantage. By pushing his opponent wide into the blockage, the attacker can escape knowing that his opponent will need to slow or even reverse to negotiate the blockage. The Insider – One of the newer methods of contact, The Insider move came about from an evolution of car design which allowed drivers to attack using the front right corner of their cars, without fear of bursting their tyre or bending the axle. It is one of the more difficult and advanced maneuvers to get right, but when it succeeds, it’s one of the most powerful forms of contact. The attack begins when a driver manages to lunge up the inside of an opponent into a turn. The aim is to use his bumper to hit the opponents car somewhere around the front third of his siderail. The force of the contact travels across the front of the opponents car, and their front wheels break traction, turning them towards the outside of the turn and the fence. The opponent will have to back off their throttle in order to regain control of the car. This momentary reduction in speed is all that is needed for the attacker to gain enough of an advantage to not only pass his opponent, but also have enough breathing room at the end of the next straight to enter the next turn without fear of a returned compliment. Spinning – If a driver is presented with the opportunity to spin an opponent, he is well within his rights to do so. Spinning an opponent is not something which can be planned, it is more of a bonus manoeuvre where a driver may take advantage of an opponents mistake. The opponent may for example have overcooked it going into or coming out of a bend, allowing the attacker to perform a crafty nudge into their rear quarter, and spin the opponent right around. It should be noted that it can (and does) very easily go just as badly for the attacker as it does for the opponent on the receiving end. Even the most skilled of the Superstar Drivers can find themselves in more trouble than they anticipated when executing a move. A slightly misplaced bumper can have the attacker throwing themselves wide into the barrier, or spinning around a full 180 degrees to face the on coming traffic. Full Contact racing is not all about being able to hit the other drivers on the track. One of the most important aspects is the ability to anticipate when a hit is coming your way. Inevitably whoever the driver, be it a rookie or a Superstar, there will be moments during a race when the prime objective is to keep someone behind them. Setting up and positioning your car to take a hit, and ride it out with the least interference to your own race, is as much of an art as being able to dish it out. When you draw up the rules for a motorsport that allows Full Contact, then in the interests of driver safety, limits must be applied. Those limits are strictly NO “Follow-in” maneuvers. A “Follow-in” is designated as when an attacking driver makes no effort to follow the race circuit and instead focuses on taking a rival driver “to the fence” at speed. One of the most exciting aspects of BriSCA F1 Stockcar Racing is “The Last Bender”. The Last Bender is quite literally a moment of action that takes place on the last bend of the last lap. Very often in BriSCA F1 the racing is so close, that the winner of the race is decided on the last bend. As two rivals tear into the last turn, and the race comes to it’s full climax, the crowd will be on tip-toes in anticipation of the outcome of one last do or die moment of contact. Will the leader ride out the contact, will he be fired fence-wards, will the pursuer get it all wrong. The outcome of which will be either a moment of elation or despair, depending totally on which of the two drivers you are supporting. It’s magic unknown to other forms of motorsport. 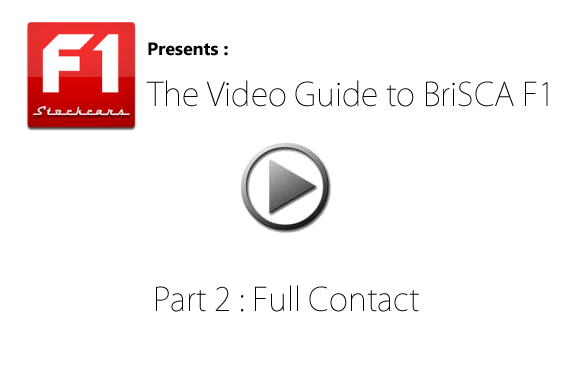 In the attached video, a compilation of all sorts of different types of contact can be seen, not only when it goes right for the attacker, but also how it can go wrong too.